Anna Center apartment can be found in the heart of Budapest only one minute walk from the main walking and shopping streets of the city center in the oldtown, right next to the metro and some bus stations. Main places of interest and museums can be reached easily from there. Anna Center is waiting for it's guests in one fully equipped (towels, linen included, cable Tv, radio) large room for 1-4 person. 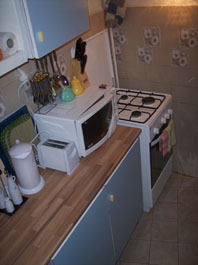 The apartment has a fully eqipped kitchen (Microwave, fridge, toaster, caffe maker, gas-cooker) and a bathroom with washing machine. 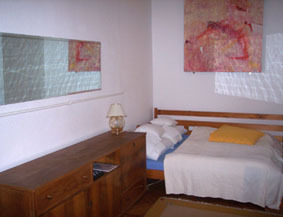 Anna Center is waiting for it's guests in one fully equipped (towels, linen included, cable Tv, radio) large room for 1-4 (max. 5 ) person. 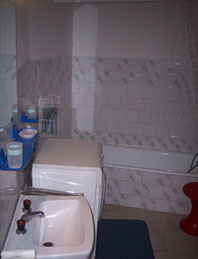 The apartment has a fully eqipped kitchen(Microwave, fridge, toaster, caffe maker, gas-cooker) and a bathroom with washing machine. 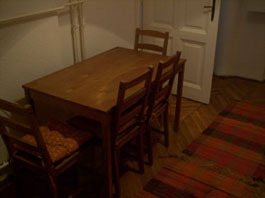 The apartment has a hall with a dining place. This give on the fully equipped kitchen, the bathroom with bath and the room with 4 beds (one spare bad can be placed) and street view. Linens, towels are included. Anna Center is placed in the heart of Budapest in the old town. Main shopping and walking streets are only in a few minutes walk distance, Just like the danube and the Corso. Many of foodmarkets or restaurants, bars and pubs can be find nearby. Places of interest like museums galleries or theaters can be reached easily. There is no peception at the propery. For that we need to know the expected time of arrival. Please enter the correct arrival time when booking or inform us via e-mail or phone. If the time added in the booking should change with more than 1,5 hours please inform us via e-mail or phone. From the airport bus no 200 can be taken to the last stop of Metro 3. From there metro goes to Ferenciek tere. From Déli Railway station Metro 2 can be taken to Deák Square (4 stops). There change to metro line 3, and go to Ferenciek tere (1 stop). From nyugati station it's in 3 stops with metro 3. 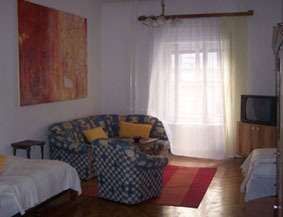 From Ferenciek tere Anna Center apartmant is in 2 minutes walk distance.